"Sweden’s Naval Museum lies on the island of Stumholmen in Karlskrona. The museum can trace its inception to 1752 and relates the history of the Swedish Navy. Amid the historical setting of the island of Stumholmen in Karlskrona the beautiful and famous Naval Museum stretches out on a pier into the water. Both young and old can here delve into the highly eventful history of the Swedish Navy on the site which has belonged to the Swedish Armed Forces for several centuries." I thought it probably would be a very good idea to visit this museum to do some research since my novel partly depicts the life at sea in the early 1800s. One can find much on the internet, but far from everything and I can happily say that I found a lot of good information about everything from figureheads to scurvy and everything in between. I'm very happy with what I've learned. 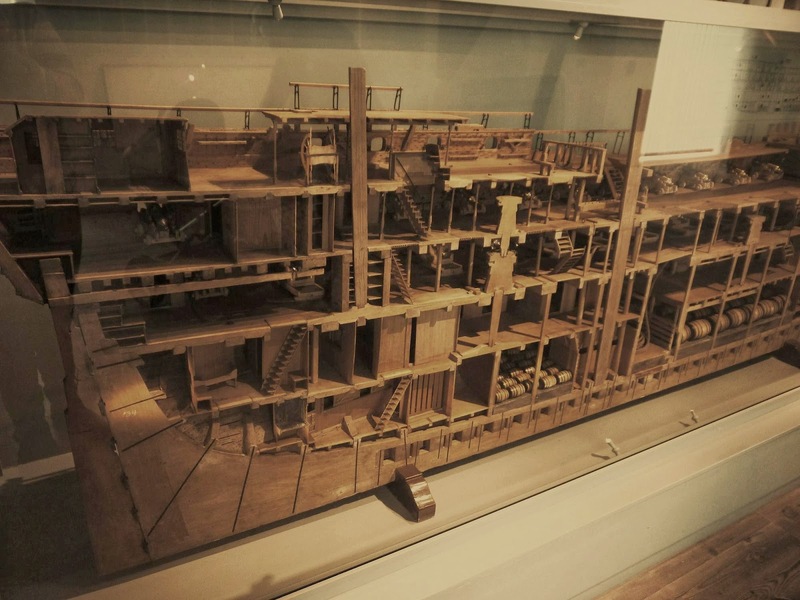 One of the most important things I needed to find out was how a ship of the line was constructed. 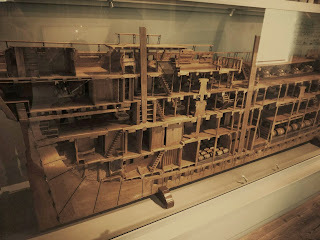 I found a perfect model of a ship cut in half so I could peek inside it and learn all the different sections. What the captains' quarters looked like, where the crew slept, where they kept their provisions etc. It was all there so now I've got the skeleton of the ship in my story. I can add the details of the ship however I want and that is, if you ask me, the most exciting part. The ship in my novel is called Merveilles, which means "wonders" in french. This ship is a majestic ship of the line and the most rich and glamourous on the seas. The crew will not live under the poor circumstances as most people did in this reality since their captain, Dominique Bonhomme, really care for his men. Of course the crew of about 500 men can't eat roasted pheasant and drink red wine every day at sea, but there wont be any meals with corn and beans as the only ingredients. I want to thank you for all your supporting e-mails.